If you're a singer like Mengchun — or even if you aren't — there are plenty of opportunities for you to perform while at IC. Yang had never visited the United States before, so leaving her home in China for a school in an unfamiliar country was a daunting task. Yet Yang wanted to focus on building skills that she couldn’t learn in China, like following a rehearsal schedule, developing a complete opera, and learning about music style and history. Rather than attending a college in a large city, Yang chose Ithaca because its local atmosphere was more relaxed, making her transition to the States easier. Like most new students, Yang faced the challenges of handling a heavy course load and finding her way around campus. On top of that, she had taken on the additional burden of speaking and writing in English, her second language. But Yang jumped right in. 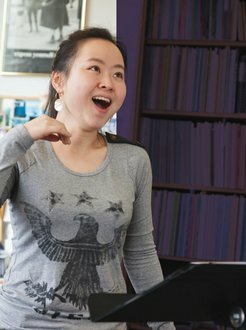 Just three weeks after she arrived here, Yang auditioned for the opera The Magic Flute as part of IC’s annual main-stage collaboration between the School of Music and the Department of Theatre Arts. Brian DeMaris, music director and conductor for The Magic Flute, asked Yang to prepare a small section of one of the Queen of the Night’s arias for callback. The role of the Queen of the Night, a lead role in the opera, is notoriously challenging. 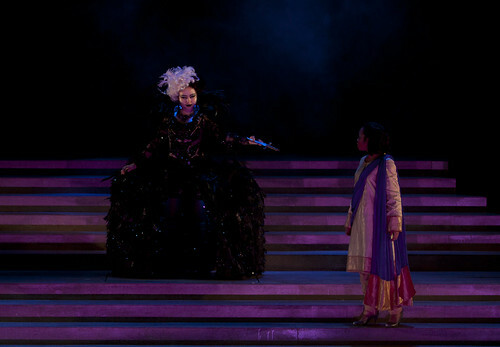 The character sings two operatic arias, both of which span two and a half octaves, which meant that Yang had to master the Queen’s extreme highs and lows. When she came back the next day for her second audition, Yang impressed DeMaris by learning both pieces overnight. DeMaris says it takes an exceptional kind of soprano to perform the Queen’s arias, and Yang worked hard to perfect her performance during rehearsals. “I remember always seeing people peer into the auditorium whenever she was onstage,” he says. To fully capture the Queen’s wicked persona, Yang spent hours practicing her facial expressions in front of a mirror, so the audience could fully realize the character’s anger and hidden evil. Rehearsing for five hours, seven days a week was tough for Yang, but she says the support she received from her fellow cast members and directors as they practiced was worth it. The cast and crew became a second family to her. The cast sang to her on her birthday, and during one of the performances, the crew recorded Yang’s aria, so she could send it to her parents in China. Though she was nervous during her first few performances, Yang says seeing her friends and faculty in the audience made her feel more at ease. Yang found that this sense of family extended beyond her preparations for The Magic Flute. Several of her professors sent her emails to check in with how she was adjusting to life away from home. During Thanksgiving break, when most students went home, DeMaris invited Yang and a few other students to his house for dinner. After graduation, Yang plans to return to China to earn a doctorate degree in musical arts, but she has performance goals in mind, too.